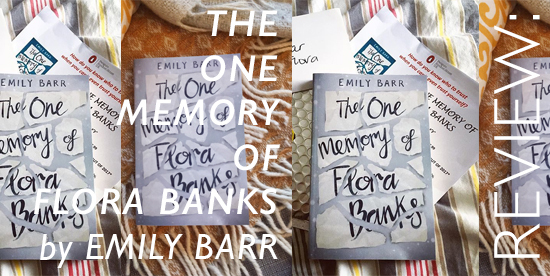 The One Memory of Flora Banks is the thrilling story of 17-year-old Flora who has suffered with anterograde amnesia since the age of 10. Unable to make any new memories, Flora has to be reminded each day of her age and situation with the help of her parents. One night, at the party of her best friend, who she has known since her childhood, Flora kisses someone she shouldn't and the next day she can remember it and their whole conversation. Convinced this kiss holds the answer to unlocking her memory for good, she takes meticulous notes (in notebooks, and in pen all over her hands and arms) to remind herself of her memory revelation and ends up figuring out how to get in touch with the boy she kissed, who has left the country for icier climbs. I absolutely adored Flora, and her determination to find herself and her memories under the fog of medication her parents keep her under. The truth slowly emerges from a tangle of lies built up to 'protect' her and as things become clearer for Flora they do for the reader too. I've seen some other reviewers struggling with the repetitive nature of the narrative as Flora's memory resets and she has to follow her trail of notes to regain her grasp of her reality, however this was not a problem for me and I actually enjoyed the tension it brought. The book opens at the close on an arctic icy cold snowy mountainside with Flora alone and feeling angry, although she's not sure why, before the story goes back in time to take us back up to this point, which is an all the more powerful storytelling tool with Flora's lack of a memory. The setting is incredible, if a little farfetched, but if you're on board with this adventure it is a total thrill ride of a story. Oh, and it's out now! I received a copy of The One Memory of Flora Banks from Penguin Random House in exchange for an honest review, honest!